The world’s only all-female tribute to Queen, The Killer Queens evoke all the glam, sparkle, power, and soaring melodies of Freddie, Brian, John, Roger, and Spike (Queen's unofficial 5th member) performing onstage in the ’70s and ’80s, while at the height of their musical and commercial dominance. The Killer Queens became a rocking, 5-part harmony singing reality with Nina Noir (Frederica Mercury), Emily Ruvidich (Brianna May), Megan Rask (Joan Deacon), Lele Rose (Spike Edna), and Karla Downey (Regina Taylor). It’s not an easy task bringing the work of true musical pioneers and one of the most charismatic rock singers in history to life, but The Killer Queens have committed every fiber of their technique and talent to conjuring a thrilling tribute to the Queen legacy. Noir understands both the flamboyance and subtle emotion that made Mercury such a commanding presence. Guitarist Ruvidich is like a fiery and impassioned encyclopedia of May’s tones, licks, riffs, and solos. Rask’s slinky low end tells you everything you should know about Deacon’s innovative yet always rhythmic bass lines, while Downey’s strong foot, huge tom sound, and shotgun snare bring Taylor’s mammoth grooves right home. Filling it all out is keyboard ace Rose with textures that recall the masterful audio productions of the albums themselves. 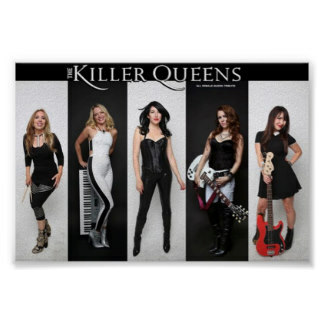 The Killer Queens are available to perform at festivals, private parties, and corporate events.